Two trays measuring 9" x 15"
And two trays measuring 6.6" x 15"
Download the complete M11 Brochure: click here! Two 16oz. Bottles of SpeedClean Cleaner... For Free! That's an $80 value, and about 2 years worth of cleaner, completely free! Try us! Call us now at 800-839-0722. We can answer your questions and help you make the best choice of a new sterilizer. The Ritter M11: Beautiful, Efficient ... and Big! 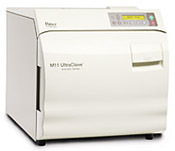 The Ritter M11 Ultraclave, like its smaller brother, the M9, is one of the most popular sterilizers on the market, particularly in medical and dental offices. The M11, like the M9, features a door that opens automatically making sterilization a set-it-and-forget-it function. It’s the newest, largest addition to the Ritter line of automatic sterilizers and in this case… biggest also means best. Featuring an 11" by 18" chamber, the M11 offers the most sterilizing capacity of any standard countertop sterilizer on the market (with the exception of the 15" x 30" Tuttnauer 3870 series) making it perfect for larger packs, cassettes, and instruments. An optional printer accessory provides lasting records of the cycle’s time, temperature, pressure, and number. And the easily accessible, front fill and drain tube means never having to move the sterilizer to maintain or change water levels. How does the M11 compare to the Tuttnauer EZ10? While we very much like the Ritter line of sterilizers, and they are very popular, the Ritter M11 and Tuttnauer EZ10 each have their own advantages. 1.) You do have a wider chamber with the M11, allowing for a little more tray space, particularly the M11's two large trays (measuring 9" x 15" — two inches wider, an inch and a half shorter, than the four trays on the EZ10, which measure 6.7" x 16.3"). 2.) The M11 runs very quiet. The EZ10, with its closed-door drying, has HEPA air filter and air pump to dry the instruments inside the chamber, and this air pump can be a little louder than the M11 in a small office. 3.) The M11 is prettier than the EZ10 and takes up less counter space. 4.) The service department for Midmark-Ritter nationwide absolutely sets the standard for every other company. They really are unmatched in service. 1.) Ritters have an automatic door that pops open at the end of the cycle, letting the steam out, whereas the Tuttnauer automatics can run a closed-door drying cycle for you. 2.) Ritters are designed with the instrument panel above the door, whereas the Tuttnauers are designed with it off to the side, where it is less likely to encounter steam. 3.) Ritters are all limited to 120V, whereas the optional upgrade to a Tuttnauer EZ10K is more than twice as fast because of its 220V, enabling it to reach temperature much quicker. 4.) Ritters come with a 12-month warranty, whereas Tuttnauers are covered for 24 months. Call now: 800-839-0722 ... or submit the short form at the top of the page to receive a quotation by email. Family owned and operated for over 31 years, Fisher Biomedical specializes in consulting with clients on their sterilization needs, having worked with medical, dental, and opthalmological offices, surgery centers and hospitals, veterinary practices, colleges and universities, government agencies and military installations, everything from small med spas up through major institutions and manufacturing laboratories — across the USA.